Elizabeth C. Economy discusses her forthcoming book, The Third Revolution: Xi Jinping and the New Chinese State, which analyzes the contradictory nature of reform under President Xi Jinping. HAASS: That’s my version of subtlety. Good evening. Welcome to the Council on Foreign Relations, and welcome to a discussion about a wonderful new book by Elizabeth Economy entitled The Third Revolution, and the subtitle is Xi Jinping and the New Chinese State. Liz, besides being the author of this and other books, is the C.V. Starr senior fellow here at the Council, and she also directs the Asia Studies Program. And what she and I are going to do for a few minutes is talk about this book, and then we are going to open it up to you all to ask any questions you might like. HAASS: I’m not quite sure how we—how we extend that in other situations, but we’ll think about that. OK. So this is The Third Revolution, so help us understand a few things. Let’s begin with revolutions 1.0 and 2.0. Place this in the river, so to speak, of Chinese history. HAASS: I’m sorry, is there—is there a specific phrase in Mandarin, or do they say “superpower”? ECONOMY: They say “superpower.” (Laughter.) And they get it. (Laughter.) And it’s—and I think it signals, basically, the belief now in China that they have not only the capability, but also the intent to be able to play alongside the United States in terms of shaping the rules of the road. And I think it is a real reflection of Xi Jinping’s third revolution because that is at the heart of the third revolution, the reclamation of a position of centrality on the global stage for China, the great rejuvenation of the Chinese nation. So, to put it in that historical context, you know, if you look back, you have Mao Zedong in 1949-1950. That is the first revolution, you know, where he created the China, you know, Communist Party state. As Xi Jinping says, that’s when China stood up. Then you had Deng Xiaoping and his period of reform and opening up. You know, the Chinese economy began to take on the attributes of a market, civil society blossomed, they got the internet, he welcomed influences from the outside world. That’s what Xi Jinping terms China got rich. And then we have Xi Jinping’s era, right, the first five years, from 2012 to 2017. Xi Jinping has really upended much of Deng Xiaoping’s approach to governing. From collective decision-making, he’s moved to consolidate power in his own hands. So it’s really much more of a single-leader model. As opposed to withdrawing the market—withdrawing the party from much of society and the economy, Xi Jinping has reasserted the power of the Communist Party in society and the economy. As opposed to welcoming influences from outside the country, Xi Jinping has constructed a kind of virtual wall of regulations and restrictions so that he can more closely control what comes into the country and what goes out. And maybe the most defining feature I think for people here in the United States and elsewhere is that Xi Jinping has really rejected Deng Xiaoping’s model of hide brightness and cherish obscurity, or maintaining a low-profile foreign policy, to embrace a far more expansive and ambitious foreign policy for China. HAASS: just out of curiosity, does Xi Jinping speak of himself and what he’s doing as a third revolution in order to suggest he’s the third great figure of modern China? ECONOMY: He doesn’t speak in those terms, but he certainly has done other things that suggest that he views himself on par with Mao Zedong and Deng Xiaoping. For example, he had his name and his thought enshrined in the Chinese constitution in a way that only Mao Zedong has had in the past. You know, he’s assumed control of almost all of the most important committees and commissions that oversee government policy in a way that Mao Zedong mostly did. HAASS: So, for me, the biggest question—we’ll see if it’s for you—is what is motivating this. Is this—to what extent is this an expression, if you will, of a personal ambition? To what extent is this ambition for China? To what extent is this done out of necessity? To what extent is he doing this out of concern or fear that if he doesn’t do it, the third revolution may turn out to be something very different and something he doesn’t want to happen? What’s behind this? ECONOMY: I know. I barely can either. (Laughter.) But the necessity one I think is the one that probably, you know, didn’t need—didn’t need to be included. I think, look, he is a strong leader. He is the first leader since Deng Xiaoping to come in with a vision for where he wanted to take the country. He articulated it, you know, as he stood on the stage at the National People’s Congress when he was first appointed general secretary, that idea of the great rejuvenation of the Chinese nation. You know, he set out his, you know, primary policy initiative, which was the anti-corruption campaign, right from the outset. You know, he said if corruption’s not addressed, it could be the death of the Communist Party and the death of the Chinese state. HAASS: Did he have a—but did he have a point? ECONOMY: Absolutely. I think—I mean, maybe not the death of the Chinese state, but certainly corruption was endemic. It was corroding the legitimacy of the Communist Party. The party had really become nothing much more than a stepping stone for personal political and economic advancement. And I think he was right to undertake the kind of very aggressive anti-corruption campaign that we’ve seen. You know, it’s been five years, and every year he’s arrested more people than the year before. Last year, 570,000 officials were arrested with a 99 percent successful prosecution rate—(laughter)—as you might imagine. To what extent does all of this represent not so much a departure, but more a return to what was the case? You said before that there were big elements of Deng Xiaoping’s philosophy—and don’t pick on me for my pronunciation like you always do, please—(laughter)—to what extent—you know, to what extent is this really a return, if you will, to a previous China, a combination like, yes, he has ambitions that are different, but also to what extent particularly domestically does this represent a return to a China that’s more top-heavy, more authoritarian, and in some ways that are familiar? ECONOMY: Sure. I think one of the interesting things that I found when I was doing the research for the book was that many of the things that Xi Jinping has been doing domestically have had long lineage throughout Chinese history. So censorship, for example, is something that dates back centuries. You know, the Chinese were always very concerned about corruption. That was another area where, again, we’re dating back centuries now. I mean, Mao Zedong began also undertaking anti-corruption campaigns. You know, every few years there are anti-corruption campaigns. I think many of the repressing elements of Xi Jinping’s approach to governance have their history throughout Chinese history. There’s a kind of a choice that any Chinese leader makes about which line of Chinese history to adopt. I mean, even in the Ming Dynasty, for example, you had periods where China was exploring. You know, the greatest explorer, Zheng He, was out sailing with his 300 ships. And then, you know, soon thereafter, the Ming Dynasty closed back down. They burned all the ships in the same dynasty. HAASS: Which actually parallels, actually, some of the conversations in Russia, the Peter the Great school versus others that you have. HAASS: To what extent has he succeeded, or is it even possible to know, at essentially—How would I put this?—that this is now the reality for the foreseeable future? Or to what extent has he yet to put down real roots? Or anther way to put it: To what extent is there pushback? I think we can say fairly that he has amassed an enormous amount of institutional power, right? So, as I mentioned, you know, controlling all of those committees and commissions. You know, he’s hand-selected the Standing Committee of the Politburo on the Politburo, not to mention apparently interviewed all of the members of the Central Committee himself. He’s had—various parts of the democracy pledged loyalty to Xi Jinping himself, as opposed to the party. So he’s done a very good job of amassing this kind of institutional authority. The question is, you know, how much personal political loyalty does he really have? So within the top leadership, for example, you know, we don’t know whether some of the top leaders really agree with all of the directions in which he’s taking the country. We know that there are some pretty significant pockets of discontent among liberal intellectuals, among entrepreneurs, you know, broad swaths of society. There’s a big feminist movement that’s emerged in China, an LGBT movement. I think there are many signs of discontent, but whether they would ever coalesce into something that would challenge him, that’s bigger and different kind of questions. HAASS: What would be the kind of context that might increase the odds he were to be challenged? Like, what does he—what should keep him up at night or does keep him up at night in terms of his ability to pull this off? ECONOMY: I think there are a lot of things that probably keep him up at night. You know, if anything goes wrong with some of his signature initiatives—for example, the Belt and Road Initiative, if that somehow stalls and peters out, or you have an enormous amount of international backlash. If, for example, there was some kind of military action around Taiwan where China did not show well, I think that would also be an embarrassment that would be difficult for him to recover from. You know, he’s put out that he’s got three critical issues to address: environment, poverty, and deleveraging the economy. I think if there was significant economic slowdown that would also substantially undermine his authority and his popularity. So I think there are a lot of things that keep him up, and the fact that he’s sort of become the sole authoritarian leader means that he’s in charge of everything, and so everything kind of redounds to him. So if there is a big failure of some sort, it reflects on him. HAASS: So one of the dangers, obviously, of that kind of model is almost like the “one child” policy: If you make a decision and it turns out to be a lousy decision, it’s—and all that, you live with the consequences. You can easily be tagged with it. Do you sense that there’s an environment around him where people actually can speak truth to power more than once? Or is—(laughter)—what’s your sense of, in a sense, how he operates things? ECONOMY: So one of the things that, again, I learned on my most recent trip was that the move to amend the constitution and to eliminate the two-term president limit was understood, you know, very poorly by many in the elite, not only in the liberal intellectuals but also some of the retired officials. It was a very unpopular, very unpopular move. And so, you know, I think that that’s the kind of thing that could cause him real problems because people feel as though they can’t have an opportunity to voice dissenting views. They feel as though he’s going to be there forever now. There’s not—they don’t feel there’s a system of openness. So one of the potential pieces of legislation that was put forward within the Chinese People’s Political Consultative Conference, which is the shadow legislature within China, was that all decisions would undergo some kind of review process a year after they had been put into place. That was tabled. It didn’t move forward. But that’s the kind of thing that some people are trying to use because they’re afraid that there isn’t that opportunity for open debate and open hearing. HAASS: And just pardon my ignorance on this. Did he abolish the two-term limit or—like, is he now in a third five-year term? ECONOMY: He can go forever. HAASS: But are there still terms and there’s just an unlimited number or terms, or is it just open-ended after this one ends? ECONOMY: Well, there are always terms because there’s—the National People’s Congress will meet every five years. So it’s a five-year term. HAASS: So technically he would have to be renewed. There’s just no limit on the number of renewals. HAASS: OK, just so I understood that. Are you—how long have you—you’ve been watching him for a while. I mean, you know China as well as anybody I know. Does any of this surprise you? ECONOMY: So we didn’t know much about him when he first came to power. He was kind of an unknown figure. We knew that he’d been in charge of the Olympics and that was a big success. He had been in charge of South Sea China policy, which had become more assertive under his direction. But really, as he moved up through the provincial party ranks, the only thing that he was known for is anti-corruption. So that was the one issue that he’d always taken onboard that he felt very strongly about, that officials should not use their positions for personal economic gain. HAASS: Do you think he was underestimated? ECONOMY: I think he was underestimated and I think people simply got him wrong. There was a lot of discussion around Xi Jinping when he first came to power about Xi as a big political reformer. That’s clearly not the direction that he moved. And a big—because in part his father had been quite open politically. So I think we didn’t know much about him when he first came to power. But he’s—you know, I read all of his speeches as part of the research for the book, and I would say that what he says is pretty much what he does. So if you want to understand him, you can read what he says in his speeches and be pretty assured that those are the policies he’s going to pursue. So there shouldn’t be much mystery around him at this point. HAASS: Do you know what influenced him in terms of either models to emulate or models to avoid? Like, does he—is there any sign, for example, that Gorbachev, and he said to himself I am not going to be the Chinese—do we know anything about him in terms of that? ECONOMY: Yes. I mean, he has said—not only did he say it to himself, he has said it to the Communist Party, to China, to the world that he thinks that the fall of the Soviet Union is exactly what he wants to avoid. And so I think that speaks volumes in terms of the influences for his political repression as opposed to political opening up because he believes that there was a loss of the power of the Communist Party under Gorbachev; that it didn’t, you know, have a sense of its own values, of its own purpose; and that when Gorbachev opened up politically, that that began the beginning of the end of the Soviet Union. HAASS: Let’s talk a little bit, then, about the implications of this for China’s behavior with the rest of the world. You alluded to it before. So let’s take one issue that’s a bit of a sleeper issue that’s getting a little bit more attention, which is Taiwan. Does this mean—and again, it’s not either/or—I mean, one interpretation is China’s tolerance for, shall we say, changes in American or Taiwanese party is even more finite than it was before. Or does it mean, conceivably, that China itself could become the agency that tries to make changes? Like, how—what’s your sense of how Taiwan figures in things? ECONOMY: So this is a big debate within the China community, about Xi Jinping’s approach to Taiwan. I don’t think that it’s very mysterious. I think he has on a number of occasions essentially said that the Taiwan issue needs to be resolved sooner rather than later, and the reunification of China is at the heart of his rejuvenation narrative, right? HAASS: Do you think he means it, that this is—this is more than a slogan? ECONOMY: Absolutely he means it because he says the reunification of China should take place by 2049, so he’s even put out a soft date. That includes the South China Sea, Hong Kong, Macau, and Taiwan. So that issue of sovereignty is paramount to Xi Jinping. HAASS: And he’d be around 90 years old then? ECONOMY: I don’t think he’s planning to see that all the way through, but—(laughter)—but he has put that out as a target, so. And you can already see that China has adopted a number of both inducements and more coercive policies to try to push Taiwan closer to China. So I think—I think that’s clearly on his agenda. HAASS: What about—so about two other or three other foreign policy things. One is the South China Sea. In recent years some of us have been, you know, a bit surprised. We certainly noticed the island-filling and the base-building and the rest. To what extent is that his policy? Do you think it’s something that’s been pushed on him and he decided that he would let the PLA and others kind of have their way with that? What’s going on there? How should we interpret that? HAASS: And it’s clearly reciprocated. ECONOMY: Yes. He restructured the military so that it resembles the American military more, with theater commands. He’s promoted people that support his vision. He’s pushed people out that he believes to be corrupt. There’s been a huge restructuring of the Chinese military under Xi. And the assertiveness that you see in the South China Sea I think is very much a joint partnership between Xi’s vision and the PLA, which is more than happy to try to realize that, you know, 80 percent of the South China Sea that they claim. HAASS: Let me just raise a few other things, then I’ll stop, because there’s a lot of expertise and experience and talent in this room—indeed, just in the seat of Professor Cohen there’s a lot of expertise and experience and talent. The One Belt, One Road, what do you think is—what’s the Chinese goal here? What’s the definition of success with this? ECONOMY: So I think One Belt, One Road began as a grand-scale infrastructure project in part to export overcapacity, as well as to set the technical and technological standards for the next 50 to 100 years. So, you know, this was a plan to connect China to 68 countries through the rest of Asia, the Middle East, Europe, and out to Africa. And there is an overland route and there is a route through the sea. And so it began as an infrastructure project, but it has morphed and evolved into something much grander. So, you know, it became a digital Belt and Road, so China wants to have control over the GPS, the satellite systems, e-commerce, and fiber-optic cables. There’s a polar ice belt to connect China to Europe more quickly. There are security implications. China now has a majority stake or controlling stake in 76 ports in 35 countries, and even though they say they’re for commercial purposes we’ve seen that PLA Navy ships have gone to visit many of those ports after China has taken control. And there’s even, I think, a political component. 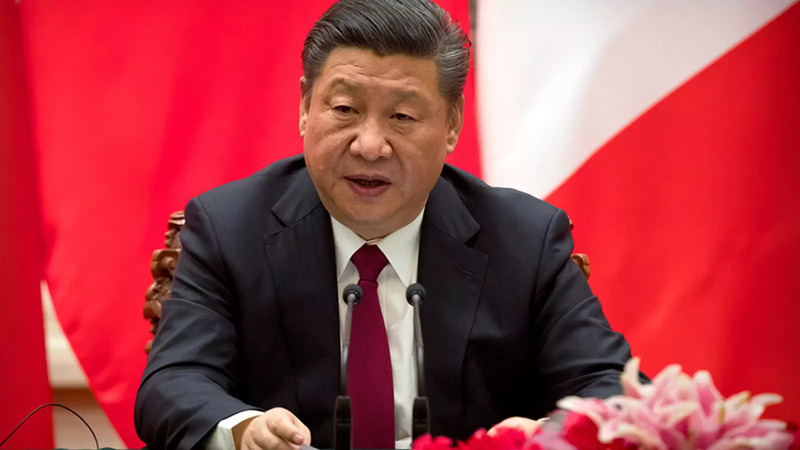 So the idea of a China model, while there is no exact definition of what a China model would be, certainly there is an effort on the part of the Chinese officials now in Africa to train officials there on how to maintain political stability, to develop propaganda. So there’s a—there’s a political, security, and economic effort. What does—what does success look like? I think success looks like not having protests in most of those countries against Chinese influence, which is what they’re facing right now. I think that’s a problem. They’re going to have to change the way they’re doing business a little bit. But, again, I think the success will be that they are going to set the technical and technological standards, you know, throughout much of the world. HAASS: Let me just ask one career-related question. To what extent do the Chinese see and does Xi Jinping see Korea and what’s going on as something that serves everything you’re talking about, or to what extent do they see it as a potential problem? ECONOMY: Talking about the negotiations right now over North Korea? HAASS: Now I’m talking what’s in play now. And given all that, how does that—just, again, his priority is what you’re talking about—the consolidation of the political situation at home, his general outward expanse of Chinese power—and then suddenly things on the Korean Peninsula have moved faster and in certain directions that I would expect a year ago he couldn’t anticipate any more than we could. So what’s your—do they see this as an opportunity, as a nightmare, as a problem? How do you think they read this? ECONOMY: So I think they very much saw President Trump’s announcement of the meeting with—the summit with Kim Jong-un as a bad surprise because they felt marginalized. And when I was in China, one of the people said, you know, well, you have to hold the meeting in Beijing; otherwise, nothing important will be accomplished. (Laughter.) So this took them by surprise. And they were unhappy as well because, you know, Kim Jong-un basically put on the table that he would freeze testing without asking for the United States and South Korea to freeze their military exercises. And that had been the Chinese proposal, the freeze for freeze. ECONOMY: So not only had Kim Jong-un agreed to meet with President Trump, but he’d done it on terms that, you know, didn’t support the Chinese interest. So I think, you know, that was of concern. HAASS: Do we know exactly how that came about? Like, did the Chinese basically reel in the string at that point and said you better show up here, or what? ECONOMY: I don’t know exactly how it came about, but I would imagine that that is as good an analysis as one might have. HAASS: Why would the Chinese care more about U.S.-South Korean exercises than the North Koreans seem to care about them? ECONOMY: Because one of the objectives for the Chinese in any set of negotiations moving down the line with North Korea and South Korea is that the United States move out of South Korea. HAASS: They better be careful what they wish for. Last question, and then I want to open it up, which is, one of—you and I have talked about this several times before, but I am—I am taken aback by the direction and speed with which the U.S. debate towards China has changed over the last six months, year. We see it in official documents. We see it, you know, including in the pages of the house magazine, Foreign Affairs, and a pretty broad consensus that even if you don’t agree with Mr. Trump’s remedies, his critique of Chinese trade behavior is not wildly off the mark; unhappiness with South China Sea; One Belt, One Road; you know, looking at the illiberalism, shall we say, to call it delicately, of what’s going on internally. But a disillusionment, shall we say, with China; much greater concern, or worse in some cases. One, is that a—I mean, what’s your reaction to this? You know, was this predictable? Do you think I’m missing it? Do you think that the slightly different take on China is accurate or something of a mistake, no pun intended? And how do the Chinese see this? Do they see this as something to worry about, or are they kind of saying we don’t really care? ECONOMY: So I think you’re right. There is a broad sense of disillusionment among almost every sector of, you know, the business community, the government officials, and the sort of China scholarly analytic community as well in terms of, you know, what they had hoped for China and what has emerged under Xi Jinping. You know, I think to some extent people that that have this big sense of unhappiness or surprise and are calling for a complete rethink misunderstood what the role of the United States could ever be with regard to China. So this idea that somehow we could be determinative, right, in the future of China and what China would turn out to look like, I mean, we can’t even accomplish that with regard to Cuba. (Laughs.) How and why would we think that we could do it with regard to China? I also think we have influenced China, and we’ve influenced it positively, through the process of engagement. You know, I look at an area that I’ve worked on for a long time, the environment. ECONOMY: Yeah. And, you know, the U.S. embassy tweeting the air pollution statistics was—played a fundamental role in ginning up Chinese civil society, environmental activism in the country. And American NGOs and European NGOs that were involved in China and the environment were, you know, funding 90 percent of Chinese civil society with regard to the environment, and we’ve played an enormous role in terms of capacity building and developing civil society in China. So, you know, I think that’s another element that they seem to have forgotten. Q: This is—this is a terrific conversation. And I just want to supplement it, as the Chinese would say, with one point. One of the signature policies of Xi Jinping, as you well know, is increased repression: arbitrary detention; the use of incommunicado detention, denial of access to lawyers, family, friends, whatever. The recent constitutional amendment establishing a new branch of government, which is the first innovation that any communist country has made in the Soviet model, this investigatory commission will have greater powers than the prosecutors and the courts. We know quite a lot about that. We’re watching it. But what we haven’t watched until recently is what’s taking place in Xinjiang, the western area of China populated mostly by Turkic, Uighur, and Kazakh people. And there we have something unknown to even specialists who are Chinese in China, the extraordinary repression of perhaps 800,000 people who are currently locked up in so-called “patriotic education concentration camps” that evoke the worst that the word “concentration camp” evokes. And it would be good to hear your comment, Liz, as part of an effort to alert people in this country, if not in China, what’s going on. It’s the most horrendous repression of human rights since Chairman Mao’s death. HAASS: What’s going and, again, why? What is motivating this leadership to take measures of this sort? ECONOMY: Right. So, as Jerry suggested, I think as much as 10 percent of the adult population of Xinjiang at this point has been reported to be under arrest and undergoing this kind of reeducation effort. But beyond that, we’ve seen that, you know, the Chinese government has called in all passports from the people in Xinjiang. They’ve, you know, forced students who have been studying abroad to come home. They’ve put, you know, very repressive things—you know, apps on people’s phones so that if you, you know, search for something related to religion or anything else, it will alert the public security bureau. There is an enormous amount. I mean, people will term it a police state at this point in Xinjiang. You know, why are they doing this? I think, you know, Xinjiang is—they’re Uighurs. There has been a small, very small, secessionist movement in Xinjiang. This goes far beyond going after the people that might be interested in secession. Some Uighurs have joined ISIS, been involved in terrorist acts. And there have been some acts of domestic terrorism, as well, that have emanated from Xinjiang. So, for those three reasons, I think the Chinese government has been more repressive in Xinjiang than it has elsewhere. But I think there’s no doubt that the level of repression and the breadth, the scale, far exceeds the threat that is posed by the people in this region. HAASS: Talk about, though, the phenomenon more broadly, because you have—let me put it this way. You mentioned that the number of people being arrested each year for corruption is going up. It’s significant and growing. I doubt every one of them is uniquely guilty of committing corruption. Either you’d have to arrest a lot more people or some of these people—there might be a little bit of selective prosecution, shockingly enough. You’ve got great use of technology to gain much more knowledge of what the population is doing, the pressure against civil society. So what is this government so afraid of? ECONOMY: Well, I think—(laughs)—the government is afraid of people who have been infected by Western liberal ideals. I think they are trying to develop a model citizen of sorts. I mean, a number of the steps that they’re taking—for example, this social credit system, which combines, you know, an e-payment system or your actual credit scores with sort of a political credit kind of thing. So, you know, who are you interacting with? How are your—how do your friends behave? You know, did you participate in a protest? Did you default on a loan? There are—different parts of the country at this point have different sets of criteria that they evaluate on people. HAASS: Oh, so your citizenship rating? ECONOMY: Exactly. It’s your social credit score. And then you are either sort of penalized—so, for example, if you’ve defaulted on a loan, you can’t—and you haven’t paid it back—then you can’t take an airplane ride or, you know, take a ride on a high-speed rail. If you’ve participated in a protest and done these other things, then you can’t send your children to some of the expensive private schools. So there’s a whole range of things that they’re experimenting with. But it’s in many different systems, at this point. By 2020, they want to have one nationwide system. And they can combine that with the surveillance system, voice and facial recognition that’s becoming much more aggressive and intrusive right now. They have 176 million cameras. They want to have more than 600 million cameras by 2020. So they want to be able to listen in on people’s conversations and know, you know, to a person, who is speaking. It’s pretty extraordinary. So of course, when you look at it that way you can understand that this is, in many ways, despite appearing as a very strong government, quite a fragile government as well. HAASS: Really interesting. Wow, resilient people. Yes, ma’am. I see—all the way in the next to last row there. Q: Hi. Willa Thompson (sp), lowly NYU graduate student. Australia has raised red flags about China interfering financially in their election process. I’m wondering if you foresee China using sharp power to interfere in any other democratic institutions in the West. ECONOMY: You know, anything is possible. I think we have not seen evidence of that happening here. I think Australia’s—their funding of political campaigns is less restrictive than ours is. So, you know, that’s part of the reason why they’ve suffered from us more than we have. But certainly, there is an enormous amount of interest in Congress right now in Chinese influence in the United States, and whether that influence is coming through Confucius Institutes, or Chinese scientists who may be taking, you know, technology back, or even in think tanks. I think this is something that, you know, Congress is looking at, but I think they need to be looking at it, you know, in a very finely grained way, because we don’t want to unleash some kind of very ugly and negative campaign against all Chinese. I think Xi Jinping has, to some extent, done Chinese people globally a disservice by calling of them, you know, everywhere—or Chinese everywhere to be in service of the great rejuvenation of the Chinese nation, because I think that puts a target on Chinese people’s backs, to some extent. So there are issues, I think, clearly in Australia and I imagine here as well. But I think we need to be really careful about how we approach these issues, how we address them, the policy recommendations that we make. You know, just sort of eliminating Confucius Institutes I don’t think is the right way to go, for example. So I—you know, there are issues, but I think we want to be very careful about them. Q: Thank you, Richard. And thank you, Liz, for an exceptional discussion. Earl Carr representing Momentum Advisors. On the issue of Taiwan, where you do you see the future of Taiwan playing out? If current trends continue, do you see Taiwan being kind of rejoined with the mainland? Or do you see the current status kind of being prolonged past 2049? ECONOMY: You know, my hope would be that—you know, that China will move forward with a degree of political reform in the future that will make the Taiwan issue a non-issue. That’s my distant—my distant hope. I am concerned because I think that China, again, is undertaking a number of inducements—so, for example, offering Chinese businesspeople national treatment for their firms if they locate on the mainland, right? So they’ll treat them the same way they would treat the Chinese firms. At the same time as they have coercive measures. For example, you know, refusing to meet with officials in Tsai Ing-wen’s government. So there are no negotiations taking place. Or, telling Chinese tourist agencies to decrease the number of Chinese tourists going to Taiwan. And Taiwan’s economy benefits a lot from those tourists. And then I think there’s really just a plan to, you know, grow China’s military capability to the point where they could take military action against Taiwan. So, you know, I think the future of Taiwan depends in part on how the United States decides to work with Taiwan, and whether or not we are willing to do more than have the Taiwan Relations Act, and say that we are committed to provide for the adequate defense of Taiwan. But actually, are we willing to, you know, potentially go to war over Taiwan? I think that’s something that we need to be thinking about in the future, at the rate and the direction that I think Xi Jinping is moving. You know, I think Tsai Ing-wen has the right idea. She’s been very moderate. She’s trying to diversify the Taiwanese economy, develop more ties. But it’s tough. And I think the United States—we’ve put our foot now in the Taiwan issue. You know, we signed—the president signed the Taiwan Travel Act, which promotes ties and meetings and exchanges between senior U.S. officials and senior Taiwanese officials, made the Chinese very unhappy about that. We’ve agreed to license Taiwan technology so that they can build their own attack submarines. So we’ve moved ourselves along a direction with Taiwan that suggests that we’re willing to do more. I just don’t know whether the president actually has thought this all the way through—(laughter)—the implications of what we’re doing, you know, far enough down the line. HAASS: Let’s behave. Dr. Knapp. Q: I’m sorry. Albert Knapp, NYU School of Medicine. A question regarding the internet. You talked about the great firewall. Can you tell us a little bit more about the great cannon? ECONOMY: The great cannon, which is their ability to sort of divert information that’s coming in and send it elsewhere. You know, China has many different techniques for preventing information from getting to the Chinese people. They have their technological fixes, like the great firewall and the great cannon. They have censors —you know, millions of Chinese censors who go after information and delete it at—you know, at any given moment. And they haver relationships with Chinese technology companies, like Tencent, where they will actually simply not allow certain terms or words to be, you know, transmitted and seen, or forwarded in any kind of, you know, email, or blog, or chat. So I think the great cannon is simply one part of a much broader range of tools that China has at its disposal to increasingly constrain information that’s being transmitted, you know, via the internet in China. HAASS: Wait for a microphone for a second. Going back to the discussion of the West’s influence on China’s development, hindsight’s 2020. But turning the clock back 18 years, were we perhaps too accommodating with regard to the terms of their accession to the World Trade Organization? ECONOMY: I don’t think we were too accommodating at the time. I think China was, you know, still very much a developing country. I think our hope was that they would—you know, Zhu Rongji at the time was pushing to dismantle state-owned enterprises. There was a sense that China was embarking on a process of increasing the role of the market in the Chinese economy. I think it was a reasonable bet at the time. We were bringing them into a rules-based regime that would allow us to hold them accountable if they didn’t, you know, adhere to the norms. So I think it made a lot of sense at the time. I think—as you say, hindsight is 2020. Now, the question is, you know, should we have done more along the way to try to push China? You know, there are many instances where companies were afraid to take China to the WTO, to bring them before the WTO. They didn’t want to stand out. That’s less the case now than it used to be. You know, we could have been more aggressive. Were there points at which maybe we should have considered trying to amend some of the rules of the WTO in some way? Maybe. You know, right now China’s trying to get market economy status. This is a huge issue in the WTO. They’ve taken the European Union and the United States now before the WTO. I think the European Union is right in the midst of negotiations over this. I mean, that’s something where implicitly we promised them that they would have that. And now we’re somewhat reneging. But, by the same token, I think it’s fair to say they have not, you know, actually lived up to their part of the bargain. So this is a moment in time when I think we can push back, right, using WTO, and say: You know, you haven’t lived up to your part of the bargain, so we’re not going to live up to our part of the bargain. But I don’t think it was a mistake at the time. Q: Hi. Thanks. Dorinda Elliott with the China Institute. So, Liz, you talked a little bit about the areas in which there might be some dissatisfaction and unhappiness with Xi Jinping. But I wonder if you can talk a little bit about the ways in which Xi Jinping is liked by the Chinese people. And, you know, I feel—I think that here in the United States we often get sort of lost in the idea that maybe the Chinese—that the Chinese people somehow feel like—are longing to be liberated somehow and freed from the oppression of the Communist Party. I wonder if you could, you know, shed some light on that and talk about that a little bit. ECONOMY: Sure. Sure. So, I think the anti-corruption campaign, by and large, has been enormously popular among the Chinese people, in large part because they are the victims of all sorts of petty corruption policies and practices at local levels by Chinese officials, or it could be Chinese doctors overcharging them for medicine, of Chinese teachers charging them for putting their child next to a heater in a cold classroom. So, you know, throughout their daily lives, the Chinese people have been subjected to this kind of petty corruption. So I think that’s one area, and it’s borne out by some polling data, that the Chinese people appreciate Xi Jinping. I think a second is a sense of national pride. I think, you know, Xi Jinping, for himself in his first five years—I didn’t finish in the very first question that you asked, Richard. He said: China has become strong. And I think there is—you know, the period of Hu Jintao and Wen Jiabao became known, that decade, as a long decade, by some, in the sense that China has failed to capitalize on all of its achievements. And under Xi Jinping, I think there’s a sense that, you know, China stands tall and proud. You know, you have the Belt and Road initiative, Xi Jinping standing at Davos talking about China as a defender of globalization, making progress on South China Sea. So I think that’s another area in which the Chinese people very much appreciate what Xi Jinping has done. ECONOMY: Thank you. Thank you, Richard. Thank you.